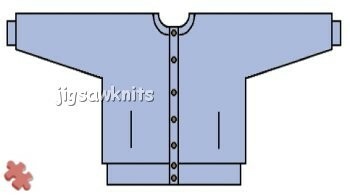 This is a pattern for a basic sideways knitted jacket with optional knitted-in pockets, in 4 generous sizes using any standard 4 ply yarn. Knitted almost in one piece, with a minimum amount of sewing up - only the shoulder seams, sleeve seams and pocket linings. Suitable for any standard gauge Brother, Knitmaster or Toyota knitting machine with or without a ribber. It can be made with many variations; fairisle borders at the top or bottom of sleeves, a fairisle panel down the centre of back and fronts, a lace panel or even small pintucks down the fronts. It has an unusual method for knitting and attaching the ribbed welts and cuffs, which gives a nice soft stretchy finish. Instructions for the variations are not included - this is the basic pattern only so you can add whatever patterning you choose. Sized to fit actual chest measurements 32 - 44 inches generously. This pattern would be suitable for a machine knitter with some experience. Also available as a printed pattern. Pattern is supplied as a downloadable Adobe Acrobat .PDF file.